INDIANAPOLIS -- The School of Liberal Arts' Max Kade German-American Center and the Department of World Languages at Indiana University-Purdue University Indianapolis will share German-American tales during a weeklong film and lecture series celebrating 200 years of German-American culture in Indiana. The series will run Oct. 2-8 and is free and open to the public. Among the week's big events is a lecture by Consul General Herbert Quelle, Federal Republic of Germany Consulate, on the topic "German Unity Against the Backdrop of Migration." Additionally, William Selm, co-founder of the Indiana German Heritage Society, a Max Kade Fellow, and a professor teaching architectural history in the Herron School of Art and Design and the School of Engineering and Technology at IUPUI, will speak about German-American contributions to the development of Indiana. "German Americans were once the largest group of immigrants in Indiana and shaped our state as we know it today, but they integrated so well that they are almost a forgotten part of our heritage. This Indiana Bicentennial series is one way to remember their contributions during National German Week," said Karen Roesch, director of the IUPUI Max Kade German-American Research and Resource Center and a professor of German. 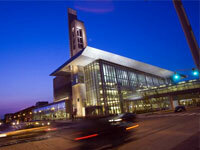 Series events will take place at the IUPUI Campus Center, 420 University Blvd. ; the IUPUI University Club at Hine Hall, 850 W. Michigan St.; and the Indiana Historical Society Basile Theater, 450 W. Ohio St.
IUPUI Campus Center Theater, CE 002, 6 p.m. Artist Annemarie Mahler fled from Vienna to the United States at the age of 13 in 1939. She is now an artist living in Bloomington, Indiana. This 2014 documentary examines her life and the role art has played in telling her story. IUPUI Campus Center, CE 305, 6 p.m.
IUPUI Campus Center Theater, CE 007, 6 p.m.
One of the legacies of German settlement in Indiana is their contribution to the state's built environment. German-Americans were builders, architects and urban planners who built for German-American and non-German clients. Germans had a hand in the creation of the Indiana Soldiers' & Sailors' Monument, St. Benedict Church in Terre Haute, the Gramelspacher-Gutzweiler House in Jasper, and the towns of New Harmony and Oldenburg, to name just a few. "The Indiana Germans Build Indiana" provides a statewide overview and sampling of how Germans shaped the built environment of the state since before statehood. Indiana Historical Society Basile Theater, 6 p.m.
For more information, email mkgac@iupui.edu, call 317-274-8740 or visit Facebook or online.